The quality of a hotel is measured only with the Service . No more bad surprises or misunderstandings. An assistant dedicated to building yours Holiday. "More Staff, More Service"
Book whenever you want, without risks, with the freedom to change your mind up to a few days before your arrival. The Giulia Hotel has more staff than the other 3 stars For us, More Staff means More Service The quality of a hotel is measured only with the Service . 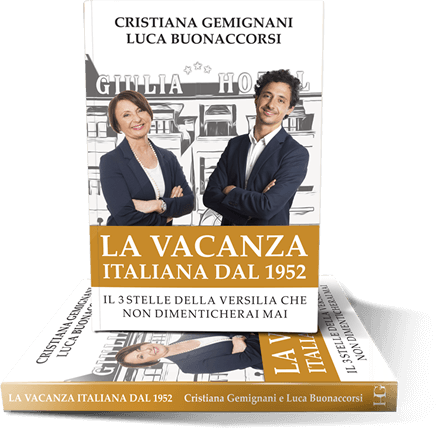 The book tells the story of a tradition that has been handed down for four generations and of the passion for hospitality that brought in1952 a couple of young engaged to invent a new way of living the hospitality starting from a five bedroom villa in the then unexplored Lido di Camaiore, strip of sea in the heart of the Versilia. Among the highs and lows of a long obstacle course, the great crisis of 2010 will disrupt the cards and lead to inevitable choices of change while remaining faithful to the vision of the founders. A new methodology in the organization of work, the creation of standards and a new way of managing a three-star, through the construction of Customized Estimates, the Safe Holiday Guarantee and a care for the Customer summarized in the motto "More Staff, More Service"
Since 1952, we want to be the best 3-star hotel. That’s why we have always taken More Staff than a normal 3-star hotel: because having More Staff allows us to offer you More Service, the only comparison to measure the quality of a hotel. We want to pamper you like no other 3 star is able to do, we want you to live a memorable experience. Giulia Hotel is the only 3-star hotel in Versilia to have the restaurant awarded by the Guide Michelin with 1 Dish + 2 Forks. Lido di Camaiore is located in the center of Versilia, one with the well-kept beach and one of the widest in Europe. What does having more staff members mean?